This is a lot like what happens if you made a muffin batter but didn't want to take the time to make muffins. But hey, we all have mornings like that. And this is a pretty healthful recipe that can be adapted to almost any fruit combination. The original used blackberries, I used blueberries, just make it what you can! In a large bowl, mix together the coconut flour, shredded coconut, cinnamon, baking powder and soda, and salt. Add in the coconut sugar, mixing again. In the same bowl, add in the bananas, eggs, melted coconut oil, vanilla extract, and almond milk. Mix until all ingredients are incorporated. Fold in the berries and spoon the batter into the greased pan. Bake for 40 minutes or until the sides are golden. The original recipe said 1/4 cup - 1 cup of almond milk but as this is a coconut flour recipe you NEED at least 1 cup. If the batter is looking more like cookie batter than muffin, you might want to add even more. Or experiment by adding another egg. This was almost not sweet enough. If I made these again I would use 1/2 cup coconut sugar. It isn't as sweet as some of the chemical sugar subs so sometimes a recipe needs more of it, not just a straight trade. *I sometimes find adding shredded coconut adds dryness, something this recipe doesn't need. I left it out. The Brick Street Cafe is located in Greenville, SC, roughly fifteen minutes from me. I've never actually sat down and had a meal there, but I have had their cake. Sweet potato, chocolate, etc. All delicious, a well deserved cake reputation. When I saw a random blog claiming to have their recipe for chocolate cake, I had to give it a try. I'm not sure it's the same cake but it was a big hit regardless! If the cake looks a bit squatty, it is completely my fault. I didn't pay attention to the pan requirement and realized too late (for the hundredth time) that I do not HAVE a tube pan, which is what the recipe calls for. The two pans hold similar amounts, but there is a marked difference in how easy it is to get the cake back out in the end. The top of the cake stayed in the pan, and was consumed for breakfast with fresh strawberries. Oh how I suffer. I brought this to a book club meeting, our annual dinner where we discuss nominations for the next year's list. We had 53 candidates that had to be narrowed to 10! Sometimes when you get a bunch of women together, everyone pretends not to eat dessert, so I was a little nervous about bringing one. But I just couldn't find salad inspiration like I had previously, so I went with my instincts. And some people had two servings! I would consider that success. I had to Julia Childs it a little and still ended up telling about the cake top, but like Julia, poured myself a glass of wine and served it anyway. I do think if I made it again I'd bake it in 2-3 cake layers and make a rich chocolate buttercream or a ganache mousse combo, because what I love better than a rich chocolate cake is a rich chocolate cake in layers with other rich things. It is blueberry season and it is HOT outside. Hot and humid. That is when I start craving blueberry baked goods with iced coffee. I looked at a few lower carb, grain-free recipes, and ended up adapting one. I guess that makes this my recipe! We liked these. They aren't mushy like some grain-free recipes can be. In a medium-sized bowl, mix the almond flour, ¼ cup arrowroot flour, coconut sugar, sea salt, and baking powder. Slowly add the wet ingredients to the dry, and mix until just combined. 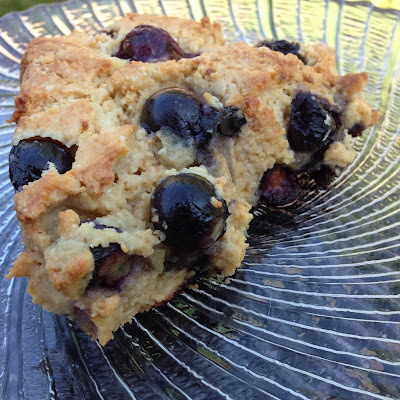 Add your blueberries along with the last ¼ cup of arrowroot flour. Form the batter into a ball and place on a parchment paper lined baking sheet. Press into a circle and cut 8 wedges. Bake at 375 for 18-20 minutes, or until golden brown on top. I replaced the maple syrup with coconut sugar since it is lower on the glycemic index. I knew that would leave me without some of hte moisture. As it was, the comments on the original recipe complained of dryness. My simple solution was to just use 2 eggs. I could have used 1/4 cup almond or almond-coconut milk in addition to the 1 egg. The batter was a bit sticky but after they baked it was a nice sconelike texture. I prefer coconut oil to butter when working with almond flour. I have seen it make a big difference in texture. I don't understand the science but have started making that replacement across the board. Fresh blueberries got a bit demolished in the final mixing step; frozen berries might work better here. This pie has been on my mind a few years now, ever since coming across it in Southern Living. I finally had all the ingredients in the house at one time, so once we got more fresh local strawberries, I proceeded to make this pie. I'd say the best part is the crust (see notes for a mistake I made!) since I'm not a huge fan of condensed milk-jello concoctions (but wow, these ingredients seem very popular with summer pies.) While this is meant for a summer pie and is likely best with fresh berries, since it is ending up in the freezer, it can't hurt to use frozen fruit thawed. It would save an entire appliance since nothing has to chop up the berries. 1. Preheat oven to 350°. Stir together first 3 ingredients; firmly press on bottom, up sides, and onto lip of a lightly greased 10-inch pie plate. Bake 10 to 12 minutes or until lightly browned. Remove from oven to a wire rack, and cool completely (about 30 minutes). 3. Beat condensed milk and next 2 ingredients at medium speed with an electric mixer until smooth. (Use the whisk attachment if using a stand mixer.) Add strawberries; beat at low speed just until blended. Transfer to a large bowl. 4. Beat 3/4 cup whipping cream at high speed until soft peaks form; gently fold whipped cream into strawberry mixture. Spoon into prepared crust. Cover and freeze 8 to 12 hours or until firm. 5. Beat remaining 1 1/4 cups whipping cream at high speed until foamy; gradually add granulated sugar, beating until soft peaks form. Spread over pie. Freeze 1 hour or until whipped cream is firm. I used an immersion blender to chop the berries. I didn't want to have to wash the food processor for that wee task. The recipe doesn't say how to serve the pie, but letting it sit out at least 30 minutes before serving seems about right. It needs to stay in the freezer otherwise. Don't forget to allow for the overnight freezing time! This pie can't be served immediately.